The Oklahoma State University Center for Veterinary Health Sciences welcomed 14 grandparents and 17 grandchildren as part of OSU’s 2015 Grandparent University. The two-day event is designed to give children ages 7 to 12 and their grandparents a closer look at the world of veterinary medicine. 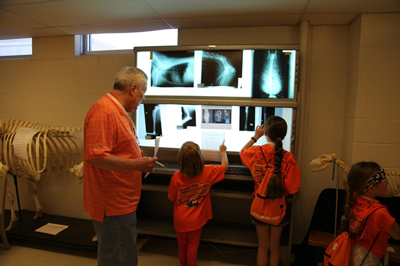 In the Dr. Duane R. Peterson Anatomy Learning Center, children and grandparents looked at radiographs to help determine each patient’s diagnosis. Participants were able to listen to a horse’s heart, use an endoscope to look inside the stomach of a stuffed demonstration dog (which contained a miniature wrapped candy bar for each child), visit the dairy during milking time to see the milking process, look at radiographs of various animals and simulate surgery on a stuffed toy, among other activities. Those that helped make the event possible included veterinary student ambassadors Miranda Anthony, Kaylynn Gruntmeir, Lauren Powell and Cameron Smithee; staff members Chris Pivinski and Emily Snow; senior equine medicine students; and faculty instructors Drs. Kelly Allen, Elisabeth Giedt, Andrew Hanzlicek, Brian Herrin, Camilla Jamieson, Yoko Nagamori and D. L. Step.